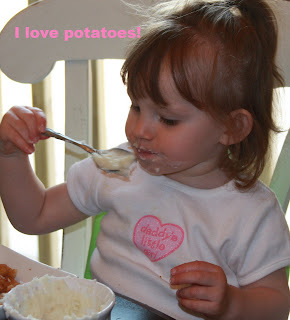 Sarah decided to feed herself mashed potatoes the other night! I think there was more on the floor, than in her mouth, but she thoroughly enjoyed herself! The nightmare project! This deck was supposed to be done weeks ago and it is still not finished. It has been a frustrating week of dealing with a deceitful contractor. He has a story for everything and we are done with him and his stories. We had to threaten that we were going to an attorney and The Better Business Bureau. The sad part is that the foreman is awesome and is so meticulous with everything that he does. We are waiting to hear back from the township inspector and hopefully this will be done in 2 weeks max! We have some parties to throw! This was a rough week. In addition to dealing with a shady contractor, both the kids had strep throat. So that meant 2 trips to the pediatrician and to the drugstore for prescriptions. By Friday, I started coming down with a sore throat. Needless to say, most of the weekend has been spent in bed resting up. I hope this is a better week! hope the kids feel better! That is going to one beautiful deck, when it is finished. Who doesn't love potatoes? I know I do! 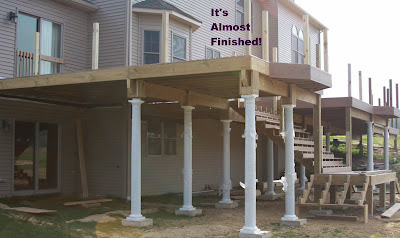 That deck will be awesome when it is done!